Teoma Web Search is the PUP that uses misleading techniques to prevent removal. Use Reimage to locate malicious components and get rid of them faster than with uninstall instructions. A full system scan blocks virus reappearance and prevents traffic to malicious domains. 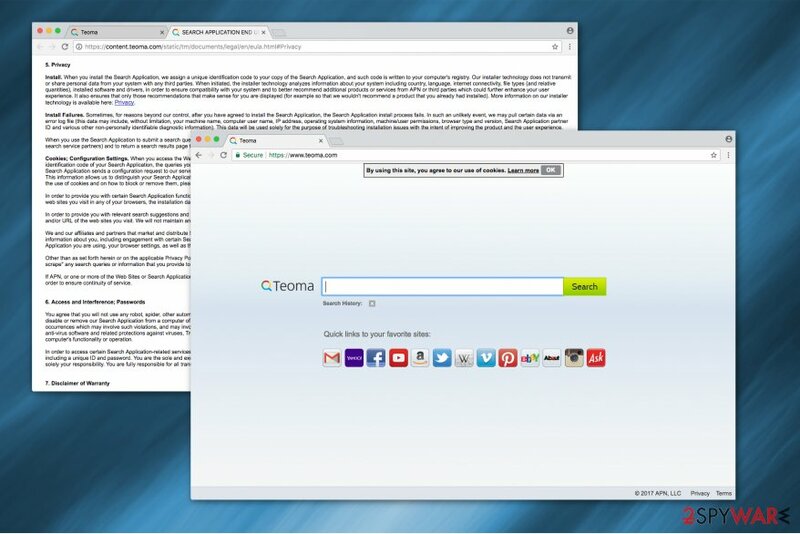 Teoma Web Search is an unreliable search provider which can hijack your regular browser. Experts note that it is classified as a potentially unwanted program (PUP) since it can infiltrate on your system without your consent. The primary goal of this browser hijacker is to deliver altered search results in order to display sponsored ads and generate pay-per-click revenue. Once this fake search engine infiltrates the system, it may cause lots of unwanted activities. Typically, this program may modify needed system's settings so that it could begin its redirections on each of web browsers. In most of occasions, Teoma hijack appears on Internet Explorer, Google Chrome, Mozilla Firefox, but there is no guarantee that it won't take over Safari or other browser. After that, this unreliable application may start showing altered search results that might be filled with commercial pop-up notifications, links, banners and other content. If you don't want to be tricked into visiting unknown and suspicious websites, you should remove Teoma Web Search immediately. Beware that Teoma Web Search redirect is mostly initiated for helping these sites increase their page rank or sales. Nevertheless, they may also trick you into downloading other questionable programs to your computer. If you continue to use its services, you risk to infiltrate malicious programs on your computer. Teoma Web Search is an unreliable search engine which collects information about its users. Finally, you should know that Teoma Search may also start tracking you and may record data about your browsing habits without any permission asked. It may collect your search terms, mostly visited websites, data that is entered by the user and similar information. 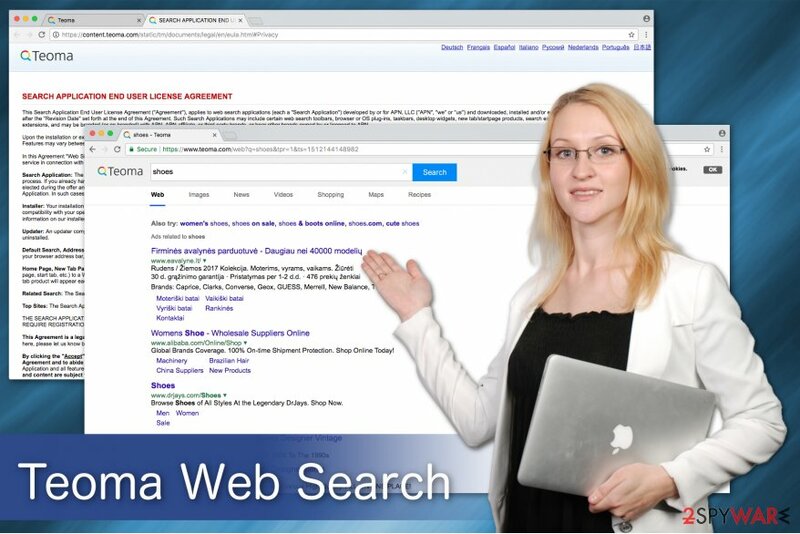 Likewise, these are the main reasons why we highly recommend to perform Teoma Web Search removal right now and start using well-known search engines, such as Google, Yahoo or Bing. If you have already noticed that your daily Internet routine is interrupted by this unreliable application, you should waste no time and scan your computer with Reimage or other reputable anti-spyware. You can manually install potentially unwanted programs along with Teoma Web Search virus together with free applications. Developers of third-party software are not honest and hide the information about the browser hijackers during the download/installation process. Likewise, you should try to pay more attention to the installation procedure of the freeware. We suggest avoiding Quick or Recommended settings of the installer. Instead of it, you should opt for Custom or Advanced installation and then try to find an entry that agrees to download the potentially unwanted program to your computer. This will help you to prevent its infiltration. Once this program gets inside the system, it immediately alters start page and default search engine so that it could make you visit teoma.com or other unreliable websites every time you start your browsing session. If you carefully follow our advice, you will remove Teoma Web Search without any complications. According to BedyNet.ru experts, automatic elimination of the browser hijacker is the safest option. You should download a reputable antivirus program to examine your files thoroughly. To make sure that you will succeed in Teoma Web Search removal, we have prepared instructions which will briefly explain how to terminate the potentially unwanted program. You can find them just below this article. However, note that you must follow them strictly since any misinterpretation can lead to permanent computer damage. Here, look for Teoma Web Search or any other recently installed suspicious programs. Wait until you see Applications folder and look for Teoma Web Search or any other suspicious programs on it. Now right click on every of such entries and select Move to Trash. When in the new window, check Delete personal settings and select Reset again to complete Teoma Web Search removal. Once these steps are finished, Teoma Web Search should be removed from your Microsoft Edge browser. You can fix Mozilla and restore its previous settings by deleting all suspicious extensions from your browser. Here, select Teoma Web Search and other questionable plugins. Click Remove to delete these entries. Now you will see Reset Firefox to its default state message with Reset Firefox button. Click this button for several times and complete Teoma Web Search removal. Here, select Teoma Web Search and other malicious plugins and select trash icon to delete these entries. Click Reset to confirm this action and complete Teoma Web Search removal. Here, select Extensions and look for Teoma Web Search or other suspicious entries. Click on the Uninstall button to get rid each of them. Here, look at the Homepage field. If it was altered by Teoma Web Search, remove unwanted link and enter the one that you want to use for your searches. Remember to include the "http://" before typing in the address of the page. Now you will see a detailed dialog window filled with reset options. All of those options are usually checked, but you can specify which of them you want to reset. Click the Reset button to complete Teoma Web Search removal process. ^ Harry Island. Potentially Unwanted Program. Malware Wiki. FANDOM powered by Wikia. ^ Kate Torgovnick May. What data is being collected on you? . TED Blog. Further reading on ideas worth spreading. This entry was posted on 2017-12-01 at 11:37 and is filed under Stealing programs, Viruses. You can quickly scan the QR code with your mobile device and have Teoma Web Search manual removal instructions right in your pocket. How did you remove Teoma Web Search?